High speed scanning at up to 30ppm/60ipm is achieved in both colour and B&W thanks to the Canon's innovative CMOS contact image sensor and high brightness LED technology. The ability to scan duplex documents at a single pass will accelerate your document workflows while a 50 sheet document feeder lets you maintain a high level of productivity. The DR-C130 is up to 50% more energy efficient than its competitors in the market. The front panel operation makes it easy to stop, start and resume scanning with a touch of a button. You can also register scan jobs using CaptureOnTouch software, and assign a job to the start button to allow for a quick execution of frequent scanning operations. CaptureOnTouch also incorporates a Full-Auto Mode function, which automatically applies the best settings to scan jobs saving you time. The DR-C130 conveniently handles a variety of media from embossed card to long sheets up to 3m in length. The scanner's three-way tray design lets you scan with the eject tray; closed, opened or half-opened providing versatility where desk space is at a premium. Reliable scanning is also achieved with the convenient double feed release system lets the user to 'ignore and continue' scan jobs, in special cases when scanning an envelope or document with a sticky note attached. The DR-C130 comes with a variety of image processing features to help you achieve outstanding quality results every time. Features such as deskew, skip blank page and text orientation recognition enable precise and accurate image reproduction. You can scan and save documents directly to cloud applications including SharePoint, Evernote and Google Docs. Information can then be retrieved using your smart phone or PC. An EMC Captiva Cloud Capture Run Time module is also available for the DR-C130, making it possible for developers to effortlessly create web-based scanning applications. 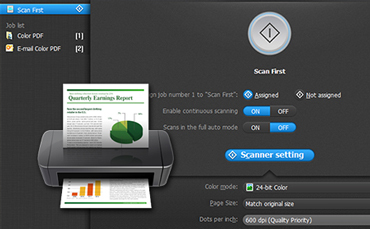 The DR-C130 comes with a full range of premium software to help you produce highly professional scanning results and create, edit and manage document workflows. 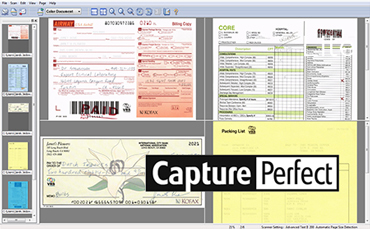 This includes CaptureOnTouch, CapturePerfect, BizCard, OmniPage, PaperPort, eCopy PDF Pro Office and Kofax VRS. Find out more about the Canon imageFORMULA DR-C130, its features and what it can do.